Nucleic acids are biopolymers, or large biomolecules, essential for all known forms of life. 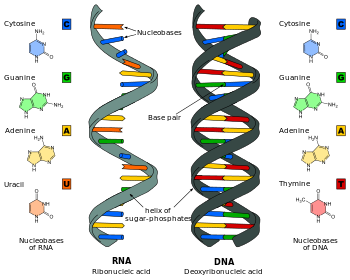 Nucleic acids, which include DNA and RNA , are made from monomers known as nucleotides. Each nucleotide has three components: a 5-carbon sugar, a phosphate group, and a nitrogenous base. If the sugar is deoxyribose, the polymer is DNA. If the sugar is ribose, the polymer is RNA. When all three components are combined, they form a nucleotide. Nucleotides are also known as phosphate nucleotides.